Glass etched with images of apple blossoms have long been a favorite among homemakers. For proof, just take a peek at Depression era glass. Of course you don’t have to restrict the etchings to apple blossoms. Dogwoods, cherry blossoms, crepe myrtle and magnolias would look lovely too. For a soft and feminine touch, consider outfitting your kitchen cabinets’ glass doors with images of Chantilly lace. It’s a widely recognized, distinctly French design from 17th century Paris. So you may want to pair it with an Old World island, wooden chairs, wicker baskets, farm-style sinks and metal pot racks. If you already have a wine rack in your home’s kitchen or plan on adding one soon, consider decorating the cabinetry glass doors with images of grape clusters. The clusters would work well with a variety of interior design schemes include Greek, Spanish and Tuscan. Prefer Old English or Tudor-style designs? Then glass fronts etched with roses are sure to please. There are various ways to incorporate the roses into the glass door panels. For instance, you could opt to go with miniature tea rose buds or images of large, luscious blooms and delicate leaves. Lastly, personal monograms remain popular with fans of vintage designs. So you may want to think about outfitting your kitchen’s glass cabinet doors and backsplash with one, two or three letter monograms. Just remember to choose a font that is legible and fits in with your kitchen’s overall design scheme. 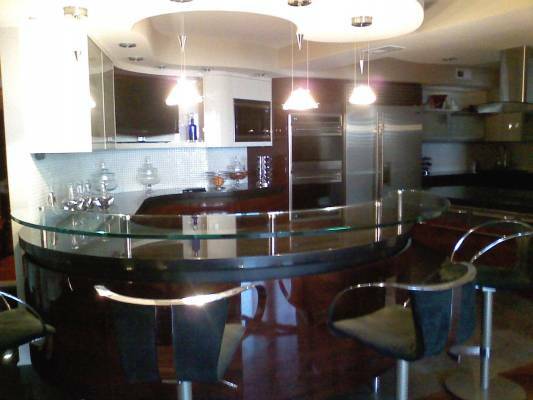 To learn more about obtaining customized, etched glass doors for your home’s kitchen or dining room, please contact us today. At Hutchison Glass & Mirror, we’ve been helping people personalize their space since 1920.